In this post, I will discuss a few tips and tricks on how to improve your kick or how to make kicking more fun. Let's start with the basics. a.) Kicking without keybboard (kickboard :) thanks @4th Dwarf) is a must for majority of the kicking exercises. Advantages include: working on stabilizing body (your core), improving balance, easier on the shoulders and much more. 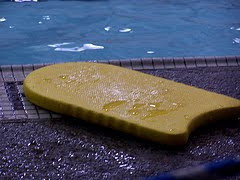 If you have to use a kickboard, cut it in half, so it is small and makes you work. Finally, if kicking with kickboards - do flipturns with both of the arms staying on the kickboard. This will help you with your stomach and keeps you focused. b.) Keep in mind that kicking on your back is much better for you due to the fact that you exercise the other side (back side) of the leg which equalizes the leg muscles (since most of your swimming is on your front). 1. Wall kicking. Start kicking holding the wall. Kick 15 sec easy, 15 sec sprint and then push off right away and swim 6-beat kick free to the other side where you will grab the wall and continue kicking. So if you decide to do 20x25 of this, you will never stop kicking, until you get done with all the 25s. Feel free to change the interval sprint/easy kicks as you wish. 2. Whistle kicking. This exercise requires a kickboard. Select a good distance, for example 500 meters and then have your coach blow the whistle every so often to let you know that you should start sprinting, when he/she blows again, you may slow down, but continue with kicking. Or you can select a time interval like 30 minutes and see how far you can get during this time. 3. Shoe kicks. Get yourself a pair of old tennis shoes. Do 6x50 with a kickboard and tennis shoes on. Pick a slower interval, because this is not easy, but this kicking exercise strengthens your legs and breaks up the kicking monotony very well. 4. Stretch cord kicks. Get a short stretch cord, attach it to the block and have a set of explosive kicks off the wall. E.g. 5x (30 sec sprint+30 sec rest). 5. Breaststroke on your back. Arms are in the streamline position, you are laying on your back and perform powerful breast kicks. The most important part is to keep flat on the water with your head back and your knees underwater at all times. Heels of your feet should almost touch your buttocks. 6. Vertical kicking. There are many variations of this excercise. a.) Sprint - Do short intervals of fly kicks as fast as you can and count how many you have done. Try to increase the number of kicks each time. b.) Longer distance - You can kick with your arm in the streamline, on your head, at your side or by you body. Make sure to keep nice and straight posture + your head out of the water. c.) Fun weights - To make this more challenging, you can hold a bucket with water above your head. To make it even more fun, you can split your swimmers into groups of 2 or 3 and give them waterproof medicine balls to throw to each other. d.) Push offs - Lastly, if you feel creative, you may have the swimmers push of the bottom as high as possible in streamline while kicking fly and not let the body fall deep back underwater. Feel free to leave a comment if you have more kicking sets you'd like to share with us. Happy kicking. It is not a secret that a swimmer has one of the best lung capacities from all athletes or at least should have. :) . 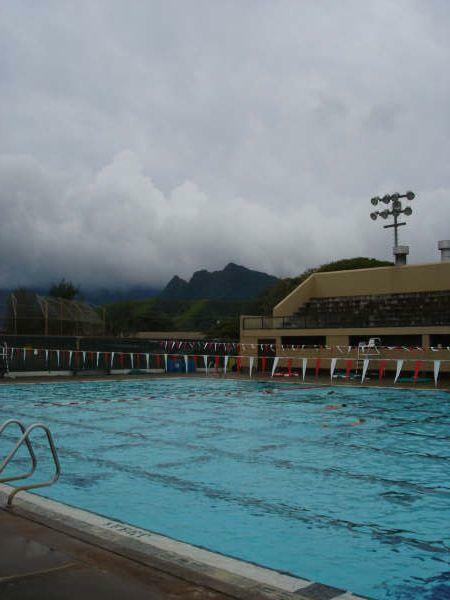 Here are a few ways how you can improve your breath holding ability during every day practice. 1. Lungbuster - exhale all your air and when no air is in your lungs, push off the wall and either sprint fly or free for a 25 or sprint fly kick underwater while in streamline with maximal speed of undulation. 2. Good ol' underwater swims - 40x25m underwater on 40 etc. 3. Hypoxic swimming - do a set of your chosen distances (3x400 or more) and vary your breathing by 50s or 100s as follows. 1x50 breath every 3, 1x50 every 5, 1x50 every 7, 1x50 every 9 and repeat all over again. 4. Fast fly kicks on your back - do a set of sprint fly kicks in the streamline, head alined with eyes looking up (not behind you), fast undulations coming from the bottom of your ribcage. Why on your back? Answer: To even out your kicking muscles due to the fact that majority kicks are on your front and also, because it is harder to keep the air in. If you can't keep the air in and it is escaping through the nose, use a nose plug (don't be afraid - top athletes do it). That is the last thing you need, air bubbles coming out of your nose. 5. Underwater turns - pick a favorite distance (not below 300) and have a set where you swim from inside the flags-to the wall-to the flags underwater, so only the section in the middle of the pool between the flags is above the water, the rest below. 6. Front snorkel - one of a great ways to work harder in the water is to limit your oxygen intake. Front snorkel is a wonderful tool which will do just that and it will help you with your head and body position. The frontside snorkel is also used for training your proper head position. Even David Marsh, a head coach at the Auburn University in Alabama, is fond of this simple tool and describes its use in his DVD set The Auburn Way . 7. Not taking breaths into the turns and off the turns. This practice is perfect for training to help you get out of it as much as you can. Take one stroke into the turn and one stroke out of the turn without breathing. 8. Breathless relays - Sprint fly or free as a relay, however, without breathing. If you are not skilled in non-breathing swimming, start with 25's, if you are more advanced I'd do 50's to make it more challenging. There is a catch though. If a person takes a breath during their part of the swim, the relay is penalized by one more swim or by time or any other penalty you can think of to make it interesting. As Richard Quick, former Stanford's Women's Swimming Coach, mentions in his Championship Winning Swimming Videos, underwater swimming is a 5th stroke and up to 60% of your races can be swam underwater. So here you have it. One last note, remember that when racing, it is not good to go into an oxygen debt, that is why you'd want to incorporate some of these excercises into your training. And also keep in mind that while in competition, if you have a perfect stroke and body/head position, you can take as many breaths as you want without impacting your speed (there is nothing wrong with that). You will swim faster with more oxygen. For helping your breathing, you can use Power Breathe (just 2 times 30 breathes a day and you'll see a difference within a week). Feel free to leave a comment if you know of any other interesting ways to help your lungs get fit. 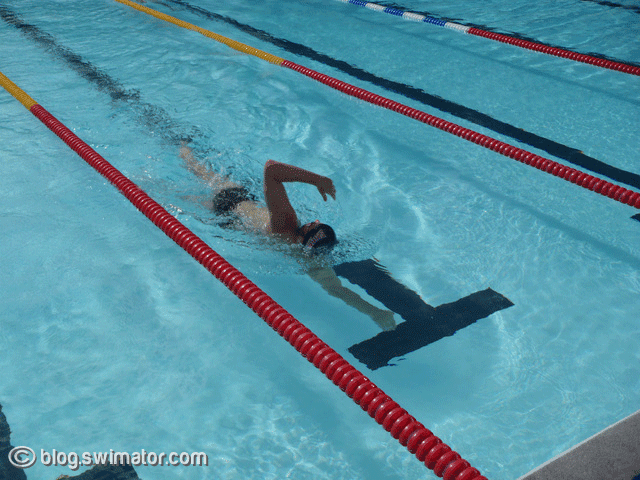 Drills, drills, drills is one of the swimming streams many coaches take in the pursuit of a perfect stroke. It is not easy to maintain a beautiful, efficient stroke in high speeds and that is when technique drills come into play. The hardest part about having the perfect stroke is the ability to change, modify and adjust swimmer's stroke as the swimmer develops. If one desires perfection he/she cannot be afraid to try new things. Swimming is a constant learning process, as many great coaches state, "to be the best, you gotta learn from the best". Here are a few tips on how to get started with good technique. 2. Do not think of technique as something that you will learn and never have to think about it again. Wrong! The perfect stroke requires constant attention, so stop your mind from wondering all over the place when you swim and focus on how the water feels, how much of it my arms are pulling, am I kicking enough, am I relaxed, do I hold a good streamline off the wall etc. 3. To help you with motivation, you may pretend that you are being watched in every single practice by fans in the stands or on the pool deck and they will laugh at you if your stroke looks like crap. Let's see you now not think about the technique. Nobody likes to be laugh at (even though it is only imaginary:). 4. Ask your peers or coach to watch you and evaluate what you are doing right and what you could correct in your stroke. 5. If you have an access to an underwater video camera, USE IT. If you do not own one, they are not that expensive to buy and are worth the purchase. Film yourself from the front, the back, from each side and from 45 degree angles on both sides in the front. Then upload the video to YouTube, Blip, or Vimeo and let me know. I will provide you with some hints on what to improve and get you swimming properly in no time. 6. Have fun and don't be afraid to play around in the water. By playing with your stroke you might discover some knew technique or movement that might just work for you. 7. Finally, relax! 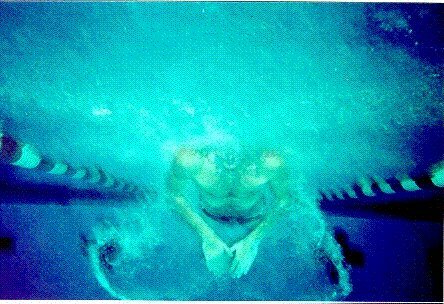 It is the ease, relaxation and efficiency of the stroke that makes you go fast, not how many muscles you put into it. Some of you already might have heard that FINA has updated their breaststroke rule to accomodate an underwater dolphin kick during the pullout phase after the initial start or a turn. The rule marked as SW 7.4 clearly states "A single downward dolphin kick followed by a breaststroke kick is permitted while wholly submerged. Following which, all movements of the legs shall be simultaneous and in the same horizontal plane without alternating movement." Not sure what to make of this, but I believe it was received with a positive feedback on many fronts. There is one country, however, that does not like this rule. As Swim News indicated in their recently published article, the Chinese swimming committee decided not to follow this rule during the China's 10th National Games. I personally think this rule will reduce the number of disqualifications and will allow for faster swimming of skilled butterfly kickers. It potentially might even help those IMers that struggle on breaststroke. Finally, I predict we will see some breaststroke world records going down with adoption of this rule. If you have any thoughts, do not hesitate to leave a comment. Rule 101.2.3 states: After the start and each turn, a single butterfly kick, which must be followed by a breaststroke kick, is permitted during or at the completion of the first arm pull. For the purposes of Article 101.2.3, as it relates to what constitutes the initiation of the first arm pull and the allowed single downward butterfly kick, the following applies: After the start and after each turn, any lateral or downward movement of the hands or arms is considered to be the initiation of the first arm pull. It has become the standard to include RSS feeds to every website with freshly updated content (blogs, news portals etc.) . Large swimming portals are not an exception. If you'd like to have your swimming news directly and automatically uploaded and displayed without accessing the website, RSS feeds are the way to go. To help you with that, there are a few programs that you might be interested in. Google Reader is a great application to collect all your feeds into one place or the Google Personalized Homepage keeps them nicely organized. Finally, where do you find the swimming RSS feeds? Well, I have compiled a few for you to start out with. Otherwise, when visiting an interesting swimming site/blog, look for a little RSS button on the bottom, sidebar or top of the page. Guess where this pool is? Where is this beautiful place? Florida, California, Texas, perhaps Hawaii? Did you ever wonder where you can find a place where all swimming history comes together forming one entity stored forever? If you haven't been yet, you definitely should visit Fort Lauderdale, Florida. A city which holds the Swimming Hall of Fame . You can find here swimming heroes starting with Duke Kahanamoku and Johnny Weissmuller, Mark Spitz all the way to Alexander Popov and beyond. 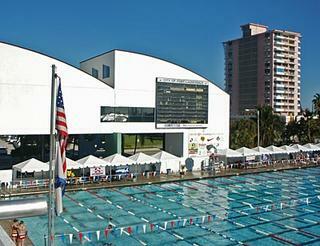 The hall of fame is right next to the home place of the Fort Lauderdale Swim Team (FLST) which used to be headed by the former Olympic coach Jack Nelson. Wanna get a scholarship in college in the US? Many good swimmers overseas want to come swim in the US, but end up staying at home due to lack of monetary resources. Believe me, there is money available for every swimmer that has competed outside US and wants to pursue his/hers swimming career at a university/college in America. I will try to outline what you need to do in order to get a piece of the scholarship pot. However, if you are not up to the task and you'd like someone else to do the legwork, read the next post regarding more detailed information about professional help on obtaining scholarships in USA. There are divisions (leagues) of college swimming in the US. NCAA Division I (DI) is for the toughest swimmers out there. To get a good scholarship money, you will need to be at least on the European Championship level with your swimming. However, there are exceptions. NCAA Division II (DII) is a little slower, but the competition is still good. Then there is NCAA Division III (DIII), if you want to receive a scholarship for swimming, stay away from that division, cause they do not provide athletic aid. However, they do have pretty good academic packages most of the time. Then there is NAIA, mostly composed of small private schools. The top swimmers on the national level would do real well in DII, but the depth of competition is lacking. Lastly, there is a 2 year college program NJCAA which has one of the best swimming out there, but is slowly falling behind in the of school participating. After completing 2 years at this college, you will need to transfer to other 4 year college where you will finish your last 2 years (an extra hassle). Well, you ask yourself. Where do I fit in? That is where you will have to do some research. The best place to start is the Swimming Index or the College Swimming site. There you can find the list of colleges and believe me, there is a lot of them. Make sure to visit the college's site and check out the swim team records, best times, rosters, also do not forget about the academic major you'd like to study (e.g. Biology). Remember, do not be pushy. It is a two way street. First, get to know the coach, then start talking money. You wouldn't believe how many recruiting letters do some of the coaches get. It is insane and some of them even start with something like 'Coach, I'd like to earn a scholarship at your school'. That is nice, but not what catches the eye. The letter is very much like your resume. It is the first impression you will make on the coach. If you have a communication with the coach going and there is a possibility of a scholarship, it is time to think of the university admission process. What tests to take, when is the deadline etc. Usually, US universities require TOEFL, SAT or ACT (sometime both). Also, probably translations of your transcripts and other school documents. After you are admitted, it is just the question of how to pay for the school. Hopefully, by now you have had a promised amount from the coach, so you should know how much to expect to pay. If you do have to pay a few bucks, remember, there is always an opportunity to earn some extra cash on campus, but it is usually not much. Final words of wisdom, if you look hard enough, you will find the school that will financially support you in your swimming endeavors. If you would like to get professional help from recruiters, you can read the following detailed information on scholarships. Good luck and keep swimmin'. The journal is written and produced by Brent S. Rushall, Ph.D., R.Psy. from San Diego State University. Dr. Rushall also is a proprietor of Sports Science Associates (Consultants in Sporting Matters) which offer many great services and publications. This research addresses the problem of variable selection needed for consideration in a potential swimmer selection. The question that is posed could be stated as follows, ‘Is there a way to correctly predict the success of a sprint freestyle swimmer based on the subset of variables extracted by the feature selection method from a large dataset?’. This work describes the use of a genetic algorithm in combination with classification techniques such as decision trees and support vector machines in the process of selecting the most viable feature subset needed for maximized and accurate classification of swimmers. Results of the different classifiers were compared against each other. The research successfully presented the advantage of feature selection by increasing the correct classification rate of a learning model by as much as 25.37% and showed the need for an implementation of a sophisticated search algorithm to find the best suitable attributes for classification.